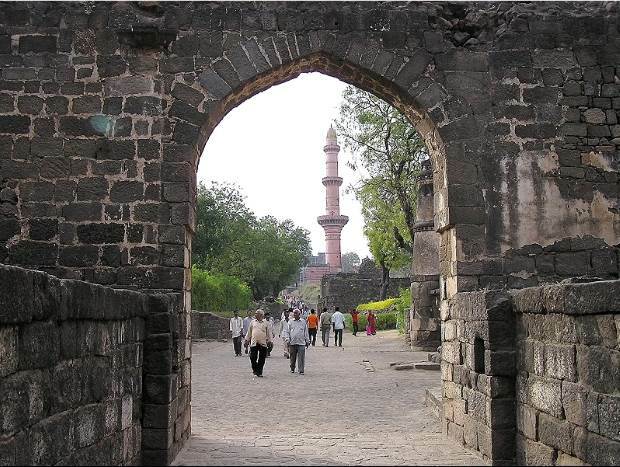 If you are at Aurangabad then you must visit this fort on your way to Ellora caves. There is an entry fee of Rs 10 and for video camera Rs 25 is to be paid. A casual visit will take 2 hours and a long walk and climb of steps are involved if you plan to visit to the top of the fort located on a hill. If it is summer months then carry one umbrella to save you from sun for one hour. This giant fort is built on an isolated pyramid shaped mountain peak. This fort is combination of a ground fort and a hill fort. Several military strategies are incorporated in the construction of the fort. The rock around the fort has been chiseled that climbing the fort was almost impossible. Opposite to Chand Minar near the Hathi Haud there is the Bharat Mata Mandir. 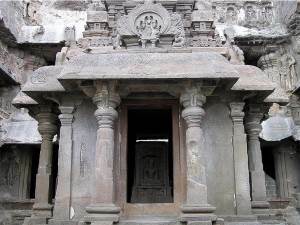 This temple has many ancient pillar halls and there is a wide courtyard in front of the temple. Within the rows of pillars there is a beautiful sanding image of Bharat Mata. 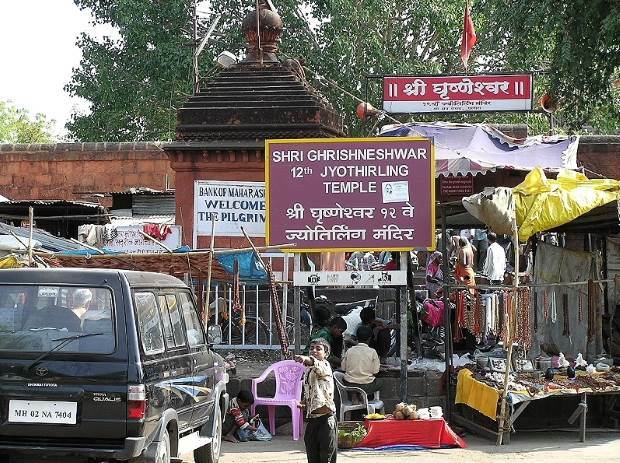 There is a dome shaped entrance gate to the temple. There is a dark passage ( Andheri ) of nearly 50 meters length with a zig-zag way which makes it impossible for stranger to pass though. Inside this dark passages there are hiding places at roof and side of the walkway for the soldiers to attack the intruders with hot oil ( from top ) and weapons. Small openings are left to mislead the enemy to fall straight into the moat. There are holes to lower or dump the dead bodies into the wet moat surrounding the central hill fort. This cannon kept over a bastion located in front of moat. The rear end of this cannon is shaped like a ram's head. It is skillfully mounted on a base so it can be rotated. On this cannon name of emperor Aurangzeb & name of its artisan Md. Arab are engraved. There is an inscription from Holy Quran toward the mouth of this cannon. In addition to this there are two more cannons Kala Pahad Cannon and Durga Cannon. 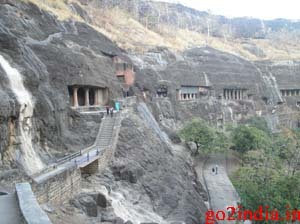 After visiting this fort you can proceed towards Ellora Caves.